A local developer kicked off a project that would bring a hotel tower, eateries and an apartment complex next to the Palms. 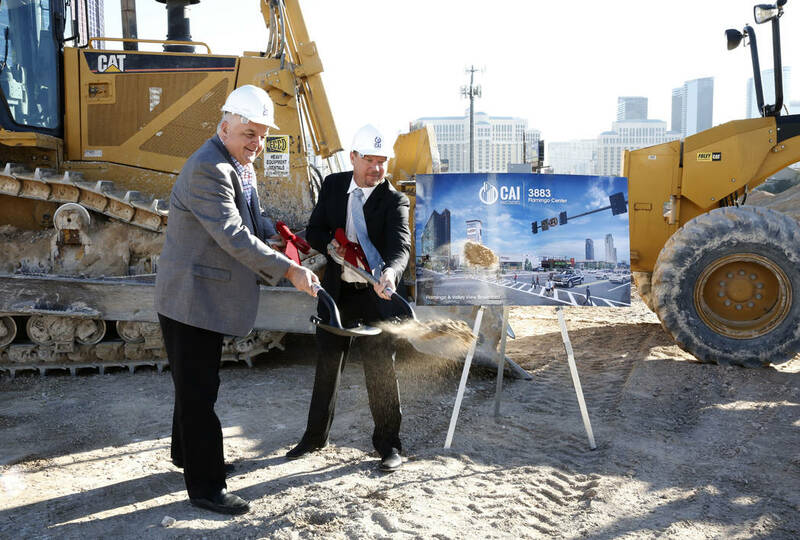 CAI Investments founder Chris Beavor held a groundbreaking Friday for the mixed-use project at the southwest corner of Flamingo Road and Valley View Boulevard, a mile west of the Strip. Beavor bought the 8.6-acre site – slated for a luxury condo tower during the bubble era last decade – for $13.5 million last year. Clark County commissioners in January approved plans for a 290-unit apartment complex, 25,000 square feet of retail and a 250-room hotel. “This corner has remained vacant for a long time, and it’s exciting to see something happening here,” Commission Chairman Steve Sisolak, whose district includes the site, said at the event. Developers have built numerous apartment complexes in the Las Vegas Valley in recent years, mostly in the suburbs, but a handful are bringing projects to urban areas as well. And while construction of megaresorts has stumbled in recent years, investors have been building and opening some nongaming hotels, albeit ones that are smaller than Beavor’s. Work crews started grading the site a week ago, Beavor said. He expects to finish the retail space – which he says would come to about 27,000 square feet – next summer. The current tenant lineup includes Walgreens, Denny’s and Wahoo’s Fish Taco, he said. He plans to complete the 17-story hotel with rooftop deck in 2020. The tower would start coming out of the ground in June, Beavor said, adding that he’s timing it with a nearby project that would connect Valley View to Harmon Avenue. Those streets are separated by railroad tracks, and the connection would provide access to the Strip via the Harmon Avenue overpass across Interstate 15. The road project, which would add ramps and a bridge over the tracks, is expected to start next summer and could take about two years to finish, Clark County government spokesman Dan Kulin said. Beavor said his non-gaming, non-smoking hotel would have a national brand that would be announced in the next six weeks, as negotiations still are being finalized. The apartment complex there would be developed by The Calida Group, which bought a 3.7-acre chunk of Beavor’s site on Monday for almost $7.8 million, property records show. Calida co-founder Eric Cohen said his group was interested in the site because of its proximity to the Strip and I-15, and that it’s walking distance from casinos and Beavor’s planned retail space. Cohen expects to “go vertical” in June and start delivering units a year later. It’s not the first time the property has been earmarked for development. But during the bloated real estate bubble of the mid-2000s, there was more money sloshing around, and the plans were larger and more opulent. Florida developer Christopher DelGuidice bought the site in 2004 for $50 million and announced plans the next year for Vegas 888. The 50-story luxury condo tower was slated to include private butlers, poolside villas, glass stairs and a nightclub called The Whale Club. In the end, he opened a sales center but never built the tower. DelGuidice lost the land to foreclosure in 2007 to financial giant Lehman Brothers, whose own collapse in 2008 helped trigger the U.S. financial crisis. Beavor bought the site from the remains of Lehman. DelGuidice’s project lives on in one way, though. When Calida acquired its section of the property this week, it bought the land through an entity called Vegas 888 Land Co LLC.